The celestial cartography is a grand synthesis of myth, art and science, that has accompanied all the development of the human civilization. 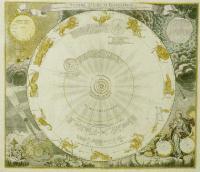 In particular, across the Modern Age, for over three centuries, cartographers and astronomers have been able to conciliate the increasing demand of scientific exactness and the taste of the symbolic and artistic representation of the starry sky, and have produced the most beautiful books ever published. In these pages we would guide the readers in a short visit through the atlases, preserved in the Library of Dipartimento di Astronomia di Bologna and in private collections, that have countersigned this golden era. Alessandro Piccolomini, De le stelle fisse. Giovanni Paolo Gallucci, Theatrum Mundi, et Temporis. Vincenzo Maria Coronelli, Epitome cosmografica. Johann Gabriel Doppelmayer, Atlas coelestis. Davide Neri has a Degree in Philosophy and is Ph. D. in Physics. He is a high school teacher and made research in theoretical physics and history of science. He also collaborated with the Museum of Physics of the University of Bologna. At present he creates hypertexts and Web pages.